Yesterday, I put on my brand new shoes to go for a run, and I wasn't too happy with the way they were fitting. My toes felt really cramped. Yes, I had tried them on at the running store, so I don't know what happened, but I decided to take them back and get a wider shoe. I called my mom from the car to tell her happy birthday, and she asked if we (the kids and I) wanted to meet her for lunch while we were out. So I went to the running store, and tried on some more shoes, and ended up buying the same damn shoes I always buy--Brooks Adrenaline's. There is nothing wrong with them, I would just like to try something NEW. And I was loving the lime green laces on the other ones I had bought. Maybe next time. When we got home, I woke Jerry up to watch the kids so that I could go for a run. I put on my new shoes and did 3 easy miles. After that, my dad asked if the kids wanted to come over, so the four of us rode to my parents house on our bikes (my parents live about 2/3 of a mile away). The kids stayed there, and then Jerry and I decided to ride our bikes up to the ice cream shop. I was a little nervous, because it's on a pretty busy road, and there are NO SHOULDERS on about half of the ride. We made it just fine, and it was actually a really nice ride. 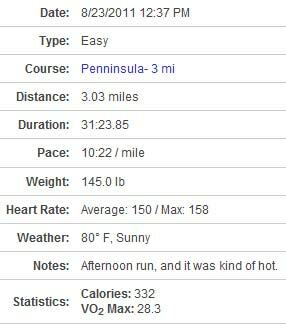 It was 3.88 miles from my parents' house. I got a Reese cup sundae, we was SO good--and even better because I felt I had earned it by riding there. Then we rode home. Because we were riding so long (over 40 minutes) I felt like we totally earned our ice cream. When I checked the stats, I realized that we had not, in fact, earned much more than the cherry on top of our ice cream. Only 220 calories burned! I didn't wear my heart rate strap with the Garmin since this was a leisure ride, so it might be off a little, but if anything, 220 is an OVER estimate. 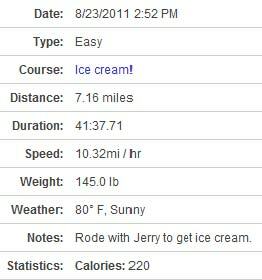 Next time we'll have to get ice cream about 30 miles away to earn it! Also, a couple of people have mentioned in comments that the first comment of each of my posts gets "eaten" by my words... when I look at it, it looks totally normal. Could someone explain that to me? Was it always like that, or just since I changed layouts? I have no idea how to fix it, especially because I don't see any problems. I'm so glad that your mom loved her ring! It is gorgeous! I'm sorry that your new shoes didn't work out because the laces were fun but I'm glad that you were smart and didn't just keep them because they were cute! I am not good about going to garage sales like you are however I have lucked out when it comes to workout equipment! My first treadmill my dad gave me and recently it stopped working but my friend was going to give hers to goodwill so she gave me hers! One of my oldest and best friends wanted to sell her norditrack eliptical she bought last year because she goes to the gym instead so I told her I wanted to buy it but she said she wanted to give it to me instead! So we will be driving to Chicago in a couple weekends to pick it up! I have a polar heart rate moniter that I wear and my dad gave it to me because he got a new one! Last but not least my shoes......my dad works out all the time so he is really supportive of me excercising so he bought me some walking shoes from the running store as an early birthday present! Needless to say I would be lost without all the amazing people in my life! Yeah, the problem with the first comment getting eaten up only started since you changed the layout. I had moved some things around on my blog and I noticed it did that, so maybe you just need to shift your gadgets around? I finally realized this year that weight loss really is more about how many calories you're taking in because it's so much harder to burn that calorie through exercise than it is to eat it! I readjusted my goals on MFP to lose a half a pound a week because I want to eat!! I didn't get out to test ride the Garmin yet! We had company yesterday, so between cleaning and visiting I couldn't make it outside! UGH! Mainly what is your 'story' were you overweight your whole life, was it only the pregnancy weight, etc,etc. I think you should get some lime green laces and put them on your new shoes! I have a question about bingeing. I've been looking at your old posts, FAQs and your sparkpage but didn't find what I was looking for. How do you define it? Is it different for everyone? How do you manage it now and the emotional aspects? I know that's more than one question - do what you can with it. PS - the ruby ring is beautiful - how about a picture of it on your mom's hand?? Love that ring! I hope she loves it too. I try to save money on workout gear as it all seems to be so expensive. Like when I decided to get all SmartWool socks I shopped around online and using ShopLocal.com to find the best deal. I ended up buying locally when a store near me had a BOGO sale. I also try to make things when possible. For example I saw these things called RackTraps on TV earlier this year. They're basically a fabric pouch with velcro that you put money, keys, etc in and tuck into your bra. I made a few out of different types of fabric and they hold my iphone and my housekey. I just tuck them into my bra when I go for a walk, run, go to a festival, etc. I hate carrying a purse so I try not to as often as possible. It works really well for running. How does eating healthy effect your kids? Do they in turn eat healthier? Do they get upset because there is rarely any junk food in the house? Also, Do you and your husband ever eat out? My boyfriend and I eat Pizza Hut once a month (thin crust though) because not eating out has been our biggest struggle. We also eat the occasional Chipotle, as it is his favorite. P.S. Can't wait for the post about wine!!! Not really a specific question, but how do you budget your grocery shopping so well. You stated you spend $100 per week now with a family of 4. I live with only my fiance and we spend about $150 per week in groceries. Of course, I do believe I live in a more expensive area than you. But still we don't even make dinner 3/7 nights because he works nights and I'll just fix cereal or a sandwich or something. It seems like you cook dinner every night. So I was just wondering how you do it! And, completely random but what does Jerry take for lunch on a daily basis? Do you fix it for him so it's healthier? I used to notice the top comment like running into the bottom of the post, however it doesn't do it anymore. It looks completely normal now everytime I visit your page. My question is how did your family/friends/aquaintances react to your weight loss when it was noticeable? The reason I'm asking is that I've had a few jealous friends who no longer even speak to me because I've "changed" (meaning I really just don't go out to fattening dinners and parties with her anymore). My sister accused me of taking diet pills! Which REALLY crushed my feelings. Up until my 50 lb weight loss goal was met I did not get any new clothes. I simply wore my baggy clothes that were too big on me and that is what people saw me in at all times. So, I guess when I eventually bought clothes that actually fit me and showed my weight loss it was an initial shock to some family members (aunts, uncles, grandparents) and I received a lot of praise for it! My one cousin told me she "couldn't be proud of me because she knows I will gain it all back". I have had some old people from high school see me and compliment me and some that pretended not to notice at all. Just truly a wide variety of reactions and I was just wondering your experiences with that. Also how do you deal with family get togethers like around the holidays? Do you limit yourself? Do you track it in your head the best you can? what is a typical day like for katie when the kids are in school? Workout clothes make me excited! Could you talk about which work out clothes you like and for what activity and which ones you don't like and why. Possibly even show us some that are your favorite! Thank you Katie. It is awesome you care about your readers questions! do you take any vitamins or supplements? if so what kind and why. :)and if you could please tell us about any health problems you had while you were overweight and how they have corrected since you have lost the weight! i know for me it was high blood pressure! i am trying to get off all the pills they put me on for that. and because i know you will only get tons of questions about your weight loss, i will ask you one about just katie! do you have any favorite tv shows? if so which ones? Sorry no major questions here...I enjoy reading your blog and seeing your stats though...I kind of compare them to mine. ;-) We are a bit similar but I never lost ALL THAT WEIGHT. I struggle with the constant "last 10 pounds". This may sound funny, but do you enjoy life more? I read your post about the different things you can do now that you have lost weight, but do you feel different and look at life through a different lens now that you're thinner/healthier? No questions here... just wanted to let you know that I don't see any issues with your comments either. They look fine to me! Love reading your blog! My question may be a repeat, but I have looked for the answer, was there a specific event, trigger, moment, or comment made to you that made you decide once and for all to get the weight off? 1. Do you like being a stay at home mom and do you keep to a schedule? SOOO glad your Mom liked the ring! It is truly beautiful!!! Have a great day Katie. The comments look fine to me. I've never noticed a problem. Maybe the people who are having trouble are using different settings on their computers? What kind of strength training do you do? I see you have "weights" listed on your workouts. What specific exercises are your favorite? Do you go to the gym, or do this at home? What made you decide to get into running, and was it difficult for you at first? I've noticed that sometimes in the past the first comment is covered by the "you might also like" section, but today it seems to be fine so I don't know if you fixed it or if it's a random thing. I seem to have trouble getting my comments to post. I use the Name/URL feature, and it often takes several clicks of the "post comment" before it will actually post. I seem to have this issue on all computers, so I don't think it is my computer or connection. I would like to know how you educated yourself on running and all the running lingo. I've always been a walker and think I might like to try running. I'm all about measuring my progress and keeping records and spreadsheets, etc. but when you talk about "negative splits" and things like that I have no idea what you're talking about. So I'm wondering did you find one or two really good references that answers all those questions and explains those things or did you just learn it as you went along and from many different sources? did you ever have embarrassing moments when you were heavier? like i once went to an amusement park and had to get off the ride in front of everyone because the safety harness would not fit around me. What are your favorite healthier snacks? I'm a snacking person! I was going to ask you about wine, but then you said a post would be coming on that! I'm excited for it! this entry is ok and not having the comments over lapping issue. as of right now i dont have any questions as of right now. I am still heavy and found we are having another baby...our last! However, I see that you dress super cute and post all your clothes that you can fit into now but I'm wondering what you would wear when you were bigger or where you would find your clothes? I find that all the clothes in the stores look like curtains and I hate it. I am really working hard to not gain to much weight with this baby but I hate seeing my reflection in the mirror. What did you do to stay motivated even when you were still at your heaviest? Because I walk/jog in the mornings and I just can feel peoples thoughts on how I look and I avoid gyms for that reason as well. Help!! Love your blog and your attention to your readers!! Your first line of words comes out fine on my computer at work, and my computer at home, so I have no problem either! Question 1) Do you always plan to be a stay at home mom, or do you want to go back to work part or full-time when your boys are older? How about that working at home you used to do for the doctor? I always thought working at home would have been nice when my boys were younger. Question 2)How can you fit into a size 4 or 6??? I'm weighing in around 147, and can just barely squeeze into my 10's!!! I wouldn't want to gain much, or they'd never zip up! My body is old, and must be weirdly shaped! What are your staple food items? Like what would be a typical grocery list for you? I'm always so curious about what people buy at the grocery store. How did you wrap your mind around stopping binge eating? Particularly, do you have any strategies that you use to avoid a binge? Katie, I love your blog! My question for you... What blogs do you read for motivation, education and inspiration? Get rid of those shoes! That is EXACTLY what has caused all of my horrific toe blistering issues, shin splints, and I've been off running for the past two weeks because my ortho thinks I have a stress fracture. Either trade them in for another pair if your running store will allow it, or invest in another pair. Trust me, the cost of new shoes (again) is less than what I've paid in co-pays!! !